With the drawdown of troops from Afghanistan taking place, the parcel requirement will reduce, though not cease altogether. There will still be some troops retained on mentoring duties and others at various locations overseas, whom we would still be intent on supporting…..with your help. With that in mind, and having access to a healthy balance of funds due to the continuing support and generosity from the general public, the trustees have decided to act constructively in disbursement of these funds. To this end, we will, in time, be making a donation of £20k to the charity ‘Hounds for Heroes’ www.houndsforheroes.com in order to facilitate the placement of an assistance dog with an injured veteran. 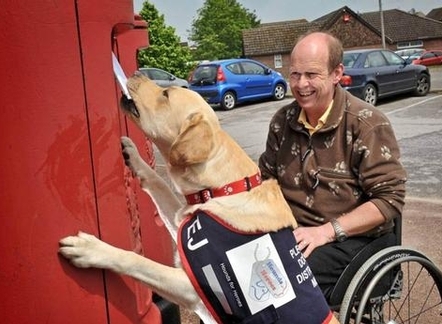 This is a young charity, founded by an injured ex-CPO in the Royal Navy, Allen Parton, which partners fully-trained dogs with injured veterans who have a restricted lifestyle due to the very nature of their injuries, but for whom life would be enhanced by the acquisition of an appropriate canine partner. The dogs are taken from puppyhood to initial placement with a ‘puppy partner’, moving on to become a fully-fledged companion via the ‘Hounds for Heroes’ training facility in Portsmouth. The complete programme, during which the eventual ‘owner’ is introduced to train in tandem, takes approximately 18 months at a cost of £20,000. Once the pair have ‘graduated’, they are then supported in the home environment for the next eight years, financially including all vets bills, practically with foodstuffs and equipment as required, and emotionally by the charity and its staff. The Trustees feel that this would be a worthy route for existing funds and for a proportion of future funds to be allotted in support of our charity undertaking this joint commitment. Various fundraising efforts will be held throughout the year and JG pages set up in support, with the first dedicated event taking place on 22 July 2014 with a Tandem Parachute Jump on 22 July 2014, being undertaken by our Regional & Area Coordinators Glenn & Elaine Middlemiss. General Donations can also be made via our main Just Giving Page on this website with a comment ‘Supporting Hounds for Heroes’, or by cheque/postal order made payable to ‘Support our Soldiers’ and sent to head office.